I remember how stressed I was after just one year of homeschooling. In fact, I thought about giving up, because it was so much harder than I had imagined. And worse, my daughter wasn’t enjoying it either. I knew something had to change. Now, after 14 years of homeschooling, I’m not stressed anymore, I love homeschooling and my children are enjoying learning too! “Kelly, About your ebook…I can’t tell you the amazing peace God filled my soul with after reading it, voraciously!…I felt like a complete failure in the education of my children. After reading your book I realized that we had been doing a lot more ’school’ than I gave us credit for.” -Amy B.
Homeschooling is hard work. But it isn’t supposed to be drudgery! After hearing so many moms who were discouraged about “keeping up”, always feeling behind, overwhelmed and inadequate, I decided to put on paper some incredible things we’ve learned on our homeschool journey. “This book changed our lives. I had no idea how I was squelching my children’s love of learning by trying to reproduce something that we already knew doesn’t work very well. Now they thrive and we’re all much happier!” -Sandra L.
Help you ask and answer important questions about education. Give you practical ideas for creating a learning atmosphere. Help you teach your children without the stress and burden of deadlines and tears. This ebook will help you bring joy to yours and your child’s learning experience! Whether you are one of those tired moms, contemplating giving up, or just need some relief, or whether you are considering homeschooling and don’t know where to start, you’ll find this ebook full of answers and practical help. “You have no idea how this book has helped me relax! 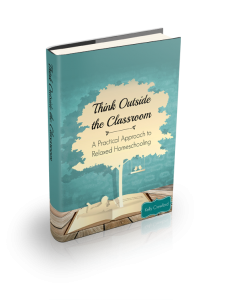 It was just what I needed, and my husband is glad I read it too!” -Katie M.
“I love the practical ideas you give in the book; it’s a philosophy backed up with ‘how-to’ .” -Sherrie R.
I just wanted to thank you for the arlcite that you wrote in TOS’s Homeschool 101 e-magazine. I am home teaching my three beautiful children, all considered normal (though I have yet to understand what normal really is). I am so encouraged by the teaching methods, patience, and down-to-earthness of special needs homeschooling moms, that I constantly find myself preferring their take on homeschooling issues. You really dispel the fears that all mothers have when dealing with difficulties that arise in homeschooling. Anyway, thanks for being such an encouragement. God bless you and your family. Just wondering, if I add this book to cart do I get an ebook or a real book? Because I would like to get some for my overwhelmed friends as well. Yes, it is an ebook. The clearness in your post is simply spectacular and i could assume you’re an expert on this subject. jailbreak your ipod. I like the helpful info you provide in your articles. I’ll bookmark your weblog and check again here regularly. I’m quite sure I will learn a lot of new stuff right here! Good luck for the next! 4.3 jailbreak. Would you please tell me if this is the same book, or perhaps a revision, as “Think Outside the Classroom: A Practical Look at Relaxed Homeschooling” by Kelly Crawford? If you wouldn’t mind sending the response to my e-mail, I’d appreciate it. I probably won’t remember to check back here for a response. Can’t seem to contact you. Your contact button isn’t working for me. Please email me. Thank you! I am a veteran homeschool mom of 7. My last son is 16 and we have been struggling with school. I was way more relaxed when all my older kids were home; we lived life together and loved homeschooling. For some reason I have been side-tracked, (even veteran moms can start to give in to peer pressure!). I am so thankful to have found your web-site and the encouragement here. Thank you! My son also thanks you!